Most cats are comfortable with small spaces and don’t even mind having to squeeze through – they like snug fits because it makes them feel safe. The opening of the PlexiDor small is 6 1/2″ x 7 1/4″ and a cat would have to be quite large not to be able to get through. 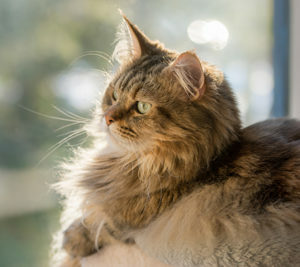 There are some very big cat breeds and if you are concerned, give us a call at 800-749-9609. We’ll help you figure it out.